Just three per cent of West Sussex’s 296 miles of council-run A roads were judged to be in need of maintenance, only 8.9 miles. In the previous 12 months, five per cent of A roads, or 14.8 miles, required maintenance. Unclassified roads, small lanes used for local traffic, also required repairs, with eight per cent in need of maintenance. In total, there are 2,311 miles of minor roads in West Sussex. 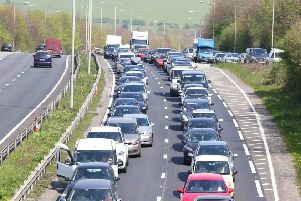 The figures also show that road conditions are better than they were five years ago, when four per cent of West Sussex’s A roads were likely to be in need of repairs. The condition of unclassified roads has improved, as from April 2012 to March 2013 23 per cent of minor roads required repairs.